Devices for Dignity is one of 11 national MedTech and In vitro diagnostic Co-operatives (MICs). We are funded by the NIHR to act as a catalyst within the NHS for the development of new medical devices, healthcare technologies and technology-dependent interventions. We focus on developing technology solutions to meet clinical needs and for chronic health conditions that are often overlooked, and that are typically associated with loss of dignity and independence, and poor patient outcomes. For more information about the national MICs and each of our specialist areas, you can visit the NIHR’s page, here. Devices for Dignity is a national body, and is hosted at Sheffield Teaching Hospitals NHS Foundation Trust. We work closely with other NIHR-funded organisations including Collaborations for Leadership in Applied Health Research and Care (CLAHRCs), Clinical Research Facilities (CRFs), Biomedical Research Centres and Units (BRCs, BRUs), the NIHR Office for Clinical Research Infrastructure (NOCRI), Research Design Services (RDSs), the Clinical Research Network (CRN), and the other MICs. 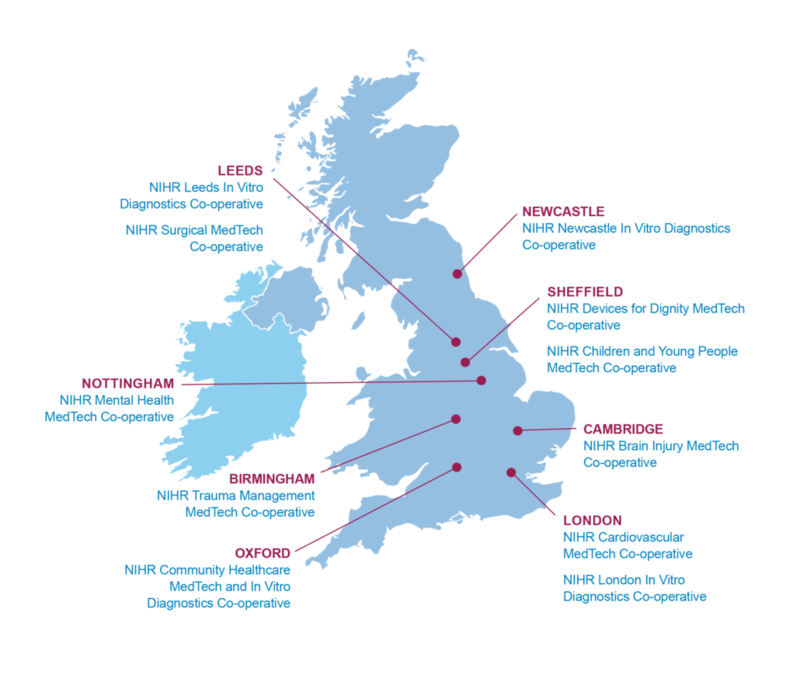 We work with Academic Health Science Networks (AHSNs) nationally, and link with Clinical Trials Units where projects need. We also work with other national bodies within the health technology space, including the Medicines and Healthcare Products Regulatory Agency (MHRA) and the National Institute for Health and Care Excellence (NICE). We are strategically linked with the INSIGNEO Institute for in silico Medicine, and the Centre for Assistive Technology and Connected Healthcare (CATCH) at the University of Sheffield. The INSIGNEO Institute for in silico Medicine co-ordinates academics and clinicians from a multiplicity of disciplines who collaborate to improve health outcomes by developing subject-specific computer models able to compute ‘biomarkers’ – measures of physiology that can support a clinical decision – which are difficult or impossible to obtain directly. These advanced computer simulations can then be used directly in clinical practice to improve diagnosis and optimise treatment, offering a path to a more personalised medicine. The Institute is at the forefront of clinical translation. You can visit INSIGNEO’s website here. CATCH is a transnational research centre at the University of Sheffield. CATCH researches, develops, evaluates and implements new technologies to enable people to live and age well. Tehir aim is to make a significant and lasting contribution to the quality of life and independence of the growing number of people with disabilities and long-term health conditions. CATCH brings together and co-ordinates the activities of over 70 academics across 17 departments and 5 faculties at the University of Sheffield including healthcare scientists, engineers, psychologists, computer scientists, architects, and social scientists. You can visit CATCH’s website here.